Summary: Learn how to drain a central heating system, drain the radiators, re-fill the central heating system and re-fill the radiators. 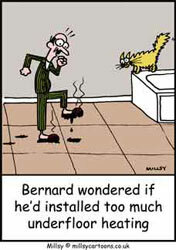 Various repairs to your central heating system will require you to drain the system. The following method is suitable for an open-vented system, which is the most common type of system installed today. If you have a gas-fired boiler, switch off the timer and isolate the gas supply to the boiler. For a solid fuel boiler ensure the fire is out and the boiler is cold. Oil-fired systems don't need to have the oil supply turned off. Turn off the water to the supply cistern. If you cannot find a stop-tap or it is too stiff to undo, you can prevent water flowing into the cistern by placing a length of wood across the top of the cistern and tying the ballvalve to it. The drain valve may be situated at the bottom of the boiler. Using a jubilee clip attach the end of a garden hose to the drain valve, then place the other end of the hose over a drain outside. Locate all the central heating system's air vents including those on all radiators, and the vent near the hot water tank if you have a fully pumped system. Check for air vents in the loft if there are any circulating pipes situated there. 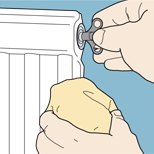 With a spanner or pliers open the drain valve by turning it anti-clockwise. The water will begin to drain from the system but at a slow rate. To speed up the flow, open the air vent valves at the top of the system - loft and top floor. As the water level falls, open the remaining air valves on the lower floor. If you cannot find a stop-tap or it is too stiff to undo, place a length of wood across the top of the cistern and tie the ballvalve to it. Open the drain valve by turning it anti-clockwise. After all the work on the system has been completed, close the valves on the radiators on the bottom floors first. Turn on the water to the supply cistern or untie the ballvalve (reversing the method you used to cut off the water supply). On the lower floor open up one of the radiator air vents. When the water comes out in a steady flow, close the air vent. Repeat this process with all the other air vents on the lower floor. When this is completed the system on the lower floor has been refilled. Repeat the process with all the air vents on the upper floor(s). 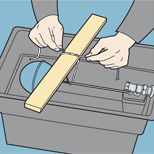 Replace the cistern's lid and insulating jacket. Following the boiler manufacturer's instructions, re-ignite the boiler. As the system starts to heat up again, air will be released so you will need to bleed the radiators. You may need to this for a couple of days. 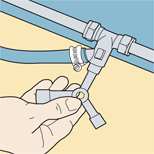 The hose can then be disconnected from the drain valve. At the same time ensure the drain valve is watertight. If the drain valve is leaking you will have to drain the system again to repair it. On the lower floor open up one of the radiator air vents and when water comes out in a steady flow, close it.